VANYA: A TRUE STORY A classic that's inspired millions! OUT OF THE DARK SHADOWS of Soviet atheism rose a fearless young man whose boldness for Christ would make him a testimony to millions of believers around the world. 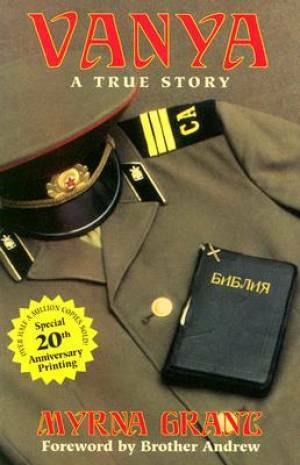 This is the true story of Ivan (Vanya) Moiseyev, a soldier in the Soviet Red Army who was ruthlessly persecuted and incarcerated for his faith. Through two years of trial and torture, he never denied his Savior, and he never hesitated to share the gospel with anyone who would listen. Twenty years after his martyrdom, Vanya's powerful testimony-which included angelic visitations and a miraculous appearance of the apostle John-continues to change lives. You'll be inspired to live for Christ in your own world as never before after you experience the gripping story of a believer named Vanya. Vanya by Myrna Grant was published by Creation House Press in July 1996 and is our 17495th best seller. The ISBN for Vanya is 9780884190097. Be the first to review Vanya! Got a question? No problem! Just click here to ask us about Vanya.